Others believe that HFT causes market volatility, or that it is a get rich quick scheme that will be the end of humans in the markets. However, there are strong counter arguments in favour of High Frequency Trading. An article published in Trader's Magazine written by Cameron Smith in 2010 points out the benefit of HFT. The world of HFT will not only stimulate people involved with finance and investment but also academics with an interest in economics and politics. To look into HFT is to open a Pandora's box that brings together politics, finance, computing and much more. In short, it will keep the naturally curious, curious. Through 1996-99 online trading took off. As internet traffic increased individual investors had access to the same share information as professional traders. As commission on transactions dropped and the bid-ask spreads narrowed it became possible for people to trade over the course of a day. In 1997 stocks started trading in one sixteenth of a dollar increments, down from one eighth of a dollar. In 2001 stock trading in pennies began. This combined with faster computing technology made the following changes: It destroyed the role of traditional market makers. Making the tick of 1/16 of a dollar was OK when large sums of capital were involved, but to profit from one penny increments a whole new system with masses of transactions was required. Sophisticated algorithms could now be used so that one ‘parent’ order could be broken up into lots of different ‘child’ orders. This was popular among investors because they would use this strategy of breaking up orders to try and prevent their order diverting the price. Whilst inefficiencies due to the price-moving effects of large orders have always existed in the market, for the first time fast traders were able to exploit these inefficiencies due to cheaper commission on trades and better access to market data. The strategy they used will be discussed in a later article. In the early to the mid 2000s the SEC actively encouraged competition between stock markets in a bid to wipe out traditional floor based trading. Then in 2001, the New York Stock Exchange (NYSE) created Direct+, which offered automatic limit orders up to 1,099 shares. This was the beginning of the end of the trading floor based system. Then the regulation 'Reg NMS' changed everything. It forced the NYSE to go all electronic and created the growth of competing Electronic Communications Networks (ECNs) and exchanges. A key rule was that the NYSE couldn't process orders that were at inferior prices to the best offers on competing exchanges. As a result of this the floor traders at the NYSE were often too slow to be able to compete with the prices that were being offered independently by specialist brokers using electronic trading methods. To react to this the NYSE dropped the share limit of 1099 on automated trades and launched NYSE Hybrid, a way to combine the computer service and the floor trading methods. In 2006 the New York Stock Exchange demutualised and this created additional incentive for exchanges to compete for profit by offering the best prices. Governments had an incentive to stamp out the old generation of specialist floor traders because they were accused of ripping off customers and creating market inefficiency. 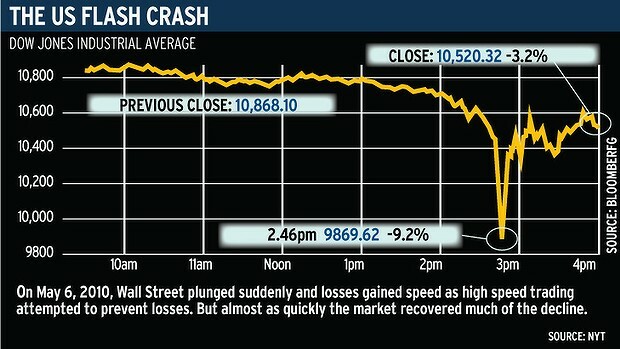 A CNBC report stated that nobody expected the squeeze by regulators to result in High Frequency Trading. At a time when HFT is talked about as needing greater regulation, there is the irony that HFT was spawned from regulation in the first place. Could further attempts at regulation simply give rise to a new set of market exploiters? The HFT phenomenon first came to light to the general public when an article was published by the New York Times in 2009. The article sensationalised the idea that HFT could be the latest greatest thing on Wall Street. It also hinted that HFT could "outsmart or outrun other investors, humans and computers alike." It cited the fact that Goldman Sachs made a profit, supposedly from high speed trading, so soon after the global economic meltdown as a reason for there to be excitement surrounding this new practice. Talking about Goldman Sachs' ability to make profit through investing in a declining stock market could be seen as a technique used to generate public interest, rather than announce the paper's negative attitude towards HFT. However, it is true that HFT has struggled to shake off the perception that it benefits from other's failure, ever since. In response to this HFT firms might mention that HFT's role as an intermediary between buyers and sellers serves a purpose. Transferring the real value of instruments makes price discovery more efficient. HFT's next venture into the public spotlight further increased the world of finance's scepticism about it. On May 6th, 2010, 14 hundred hours, 42 minutes, 44 seconds and 75 milliseconds, the price of the E-mini futures contract traded on the Chicago Mercantile Exchange became erratic. This triggered the fastest, most dramatic, fall of Dow Jones ever. $862bn went up in smoke, all be it briefly. When the E-mini futures price dropped it impacted the prices of all 500 different stocks contained in the S&P 500 index, which all needed to be repriced. Those stock prices impacted other indexes, which also needed to be repriced. Most of these instruments have futures and options traded on them, which also in turn need repricing. The market couldn't keep up with this dramatic price restructuring and, according to Nanex, fell about 36 seconds behind in its delivery of data. However as fast as the market dropped it rose back to its original level. The whole thing was over in under 30 minutes. HFT (or the lack of it, as many HFT players withdrew from the market as prices started collapsing) was blamed by some for the crash and the world of finance had even more reason to rage against the machine. It was initially blamed because there was the theory that HF traders had been aggressively selling the shares in question hence causing and benefitting from the downturn in the market. The combined SEC and CFTC official report stated that a badly managed lone $4.1bn sell order was the reason for the crash and the effect of this was exacerbated by HFT. However, this report has been somewhat discredited since. Eric Hunsader, the owner of Nanex, a firm that supplies data in financial markets, was interviewed by HFTReview and gave his reasons for discrediting the SEC report "there’s no way that the algo the SEC/CFTC talk about in their report matches up with this at all". The argument that HFT exacerbated the crisis is: that although HFT can create liquidity it can also cause episodes of periodic illiquidity. This is a complex argument that will be explored in future articles but put simplistically: The market relies on HFT firms to provide liquidity in the market. The HFT firms that are market makers predominantly use delta neutral strategies, meaning that they aren't concerned whether prices move up or down in the longer term. However, to be able to use such strategies they require a liquid market and a stock that fluctuates up and down intraday in a relatively predictable manner. In the case of the flash crash when stocks unexpectedly plunged down and continued dropping, the strategies that many HFT firms were using became unsustainable, so they left the market. This created huge illiquidity and made it harder for buyers to enter the market. Academic opinion at least, has a more balanced view of computer based trading (CBT) than most media coverage. A recently published UK Government Foresight report set out to advise policy makers about regulating computer based trading by making them aware of the risks and benefits. It also aimed to determine potential developments in the world of CBT and the effects that it could have on financial stability and market efficiency. It highlighted benefits such as improved market liquidity and lower transaction costs as well as the possible problems such as periodic illiquidity. HFT is transforming the investing world. It is controversial and has been said to move in the shadows. The purpose of this guide is not to deliberately come down on one side of the argument on HFT, but to give somebody with no prior knowledge, an understanding. To conclude this chapter I'd like to bring hope to those thinking this is a daunting topic. HFT has nothing to do with income tax. http://www.stock-trading-warrior.com/History-of-Online-Stock-Trading.html "They started by providing a web presence in 1995 and at the time had $181.7 billion in total client assets. The very next year their online stock trading went live and in 1996, they ended the year with $253 billion in total client assets. By the next year, 1997, Charles Schwab registered it’s one millionth online account, reached total client assets of $437 billion and ranked as the top online broker in the U.S."